Army officials, who are working closely with civic authorities and National Disaster Response Force teams in relief and rescue operations at the flyover collapse site, said on Friday that they were not hopeful of finding more bodies under the debris. "The focus of operations is now on debris removal and clearance of the road so that normalcy is restored. As of this morning no more bodies are expected to be found under the rubble," army officials said. The army rescue teams have been operating throughout the night along with the teams from civil defence, police and the NDRF, trying to remove the debris from the affected area. General Officer Commanding of Army’s Bengal area Lt Gen Rajeev Tewary is monitoring the progress of the Army teams closely. 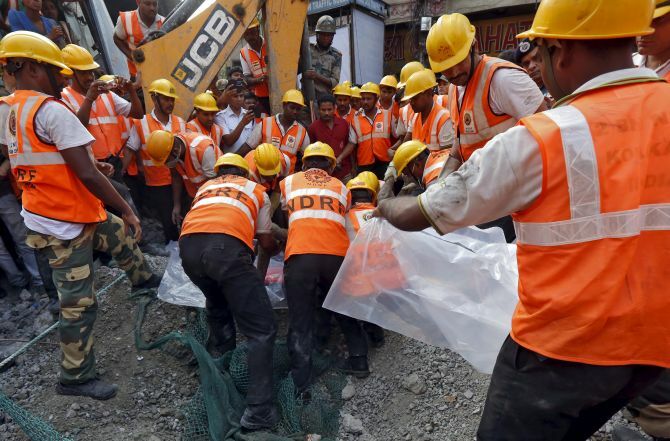 Altogether there are close to 300 Army personnel -- including medical teams, surgeons, engineers and gas cutters -- working on the spot of flyover collapse in northern Kolkata.